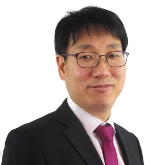 Woosuk Jung spent two years as a visiting researcher at ISDP from August, 2015. He is from the Ministry of Environment in South Korea and has been responsible for environmental policies such as soil environment conservation, sewage management and hazardous chemical control in the Ministry. His main experience includes amendment of the soil environment conservation act and the establishment of a master plan for soil conservation in 2009 and enforcement of the chemicals control act in 2015. Just before coming to ISDP, he was working at the Joint Inter Agency Chemical Emergency Preparedness Center which was founded as a new cooperative model to prevent and handle chemical disasters efficiently by five Ministries together in South Korea. With these experiences, he is doing research into formulating an effective management system to protect human health and wealth as well as the environment from the hazard of chemicals, with a focus on security. He is also interested in international environmental security issues such as global warming, water related disasters etc.